I've been thinking a lot about the value of specialists. Specialists are people with the greatest knowledge in their particular field. It is the specialist, not the generalist, that focuses his/her efforts to get to the bottom of something and/or produce something truly remarkable. The work of a specialist is in the nuances. A perfect example of the specialist gone awry (to me) is The Cheesecake Factory. I hate The Cheesecake Factory! I presume I would have loved the original cheesecakes made by the family matriarch in the 1950s. Hell, I might have even written about them in this very blast. However, rather than sticking to its knitting, it has an expanded menu that includes over 250 items. How can a restaurant produce 250 items, let alone 5 items, well? They can't! Don't think they need my business, however, as their annual revenue is ~$2.1 Billion! In this week's Loupe, I am searching for the ultimate specialists --- those who take one thing and do it the best! 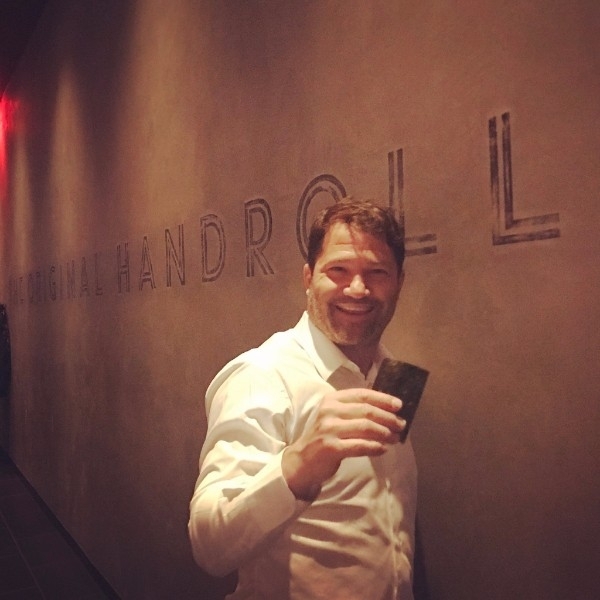 Following in the footsteps of the opening of Sugarfish, Chef Nozawa just opened spin off KazuNori, a HANDROLL ONLY restaurant on West 28th Street. If you want sashimi, sushi, or even an inside out cut roll, you better go elsewhere. This is an extreme example of specialization (with a very limited menu), but believe me, there is plenty to devour. As a result of such a narrow menu, Chef Kazunori Nozawa has perfected the seaweed (crispy & warm), the rice inside (temperature & texture), and the fish (10 kinds only). The attitude here is ... you can't always get what you want, but you get what you need. The restaurant only opened at the beginning of March, and I was alerted of it existence by fellow Louper Wendy M. They don't even have their liquor license yet, so bring plenty of sake and beer! Along the same lines, this got me thinking about restaurants that serve a single item or food group but they do it so damn well! So here it goes, the best of the one hit wonders. Everyone knows that the best dish at Blue Ribbon is not the sushi, but the Fried Chicken Blue Ribbon Style (with Wasabi and Honey)! So what did the Bromberg brothers do, they opened Blue Ribbon Fried Chicken dedicated to their love of the bird. Another single food concept, that I'm a huge fan of is ... Dumplings. Enter Mimi Chengs ... Taiwanese dumplings the way Mama used to make (if your Mom could 1. cook 2. is named Mimi and 3. is Taiwanese). With two locations, the goal of the Cheng sisters is to keep their menu simple, local, and fresh! As we continue down the line of the best of ... we've got Mac Bar dedicated to the one and only, Mac and Cheese! An annex to Delicatessen (famous for the cheeseburger spring roll), this spot seats only 10 people but offers mostly takeout, in macaroni shaped containers. Choose from creative combos like mac stroganoff, mac lobsta', mac 'shroom, or just the classic, you'll have yellow and elbow shaped overload when you walk back out onto the street. These guys know how to take a theme and run with it! Keeping in the cheesy frame of mind, what is better than the American staple Grilled Cheese and nobody does it better than Melt Shop! Stick to the sandwiches like classic (you can never go wrong with a classic), the truffle melt (a little truffle cures the world's evil), or the Maple Bacon (because bacon is never bad). Lastly, Kobe (not Bryant) came on the US food scene not too long ago. Now, it may be here to stay with Kings of Kobe, a burger and hot dog joint in Hell's kitchen dedicated to Wagyu on the go. There are more specialists out there from fries to rice pudding and more, but I'm leaving it to you to go finding! Drones, we've all heard of them but what really is the deal? Do I want one? Do I need one? Me being me says, duh yes! DJI is a company dedicated to making the best designed and manufactured drones for both professionals and consumers. They even make drones utilized by cinematographers who make the highest budget movies. As such, they used their extensive knowledge to make a consumer-oriented version (less expensive) that is the best on the market. I was first introduced to the miracle of these drones by fellow Louper and brother-in-law Neil R. Through your smartphone, you can control this sophisticated drone and take amazing pictures from above. The battery lasts up to 27 minutes and the unit flies up to 65 KM/hour with a control range of 7 KMs. You don't have to worry about losing/crashing it (Louper Evan L.) as it has active obstacle avoidance, a low battery return feature, and it is programmed to come back to exactly where it was launched from. This device is truly incredible and this company does it the best ... ahhh the beauty of specialization! I know it is hard to think about cycling in Winter, particularly during a Noreaster! However, Spring (and Summer for that matter!) is just around the corner and you need to get off the subway, out of the Uber, and get some fresh air! Martone Cycling Co. is your (chic) bike solution. They are experts in making bikes in eye-popping outrageous colors and that's all they do. These bikes are perfect for the urban commuter and the leisure rider alike. They are exceedingly stylish, and I had bike envy the first time I saw one parked in Miami. They are comfortable to ride and even have a gear system that adjusts based on how quickly you are traveling. All the bikes have the distinctive red chain. Let's hope this company doesn't branch out into other directions, although I probably would be interested in a Martone car if they made one! So, maybe that old adage reigns true that a Jack of all trades is the master of none. Let's hear it for the one-hit wonder and putting all your eggs in one basket. Consider KazuNori, DJI Mavic Pro Drone, and Martone Cycling Co. Found!